When I first heard about Engagement Chicken, I was already engaged. (This is the type of important stuff you learn on weddingbee.) Supposedly, if you make it for your boyfriend, he will propose. I had made Ina Garten’s roast chicken before getting engaged, however, so who knows, maybe it does work! Although it might seem sexist or old-fashioned to some, I have to agree that the way to many men’s and women’s hearts is a nice, home-cooked meal. It shows that you care enough to take the time to make someone a nice dinner, and it creates images of many other cozy and delicious evenings to come. A whole chicken is probably enough for four people, but I still like to make the entire chicken for the two of us and save the rest for soup, Roman-style chicken, or chicken salad. I don’t usually associate chicken with gravy, so the recipe has been adapted accordingly. Remove the giblets from the chicken. Rinse thoroughly and pat dry. Season the inside of the chicken with salt and pepper. Place the chicken in a roasting rack, breast side up. 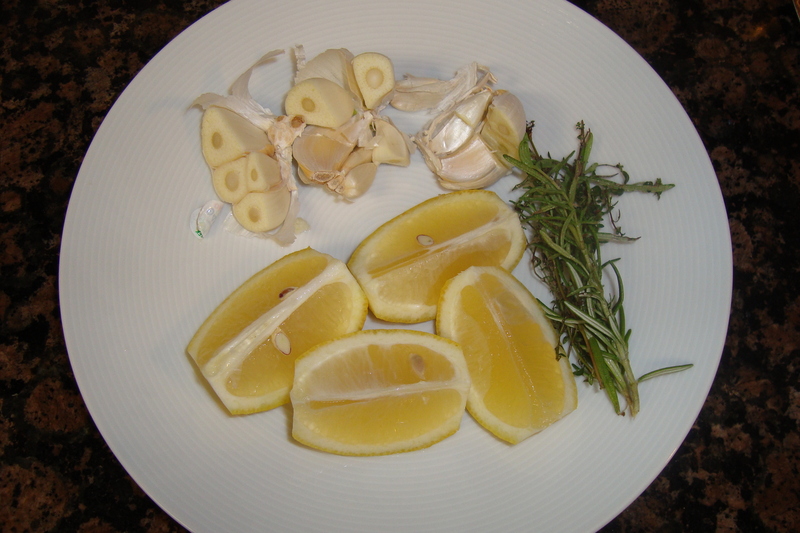 Stuff the chicken with the lemon, garlic, rosemary, and thyme. As the chicken cooks, these flavors will permeate the meat. 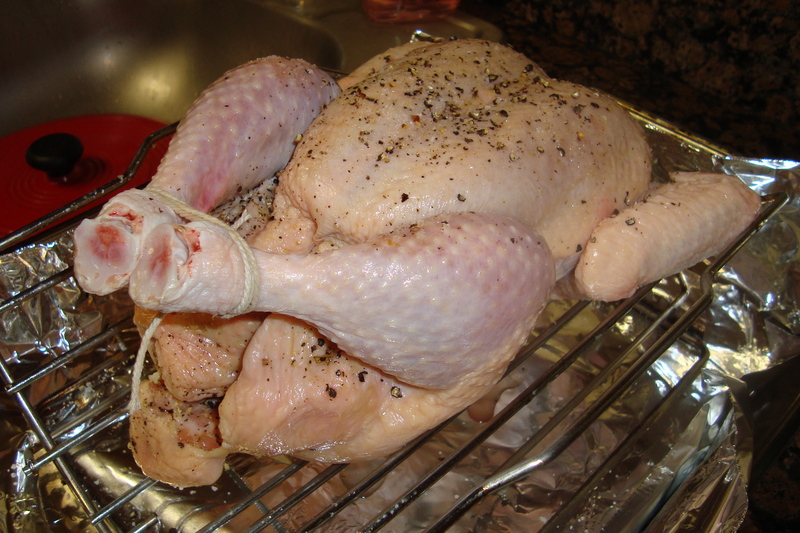 Tie the chicken legs together and pin the wings behind the chicken. Brush the outside of the chicken with olive oil, and season with salt and pepper. Roast in the oven for one hour. 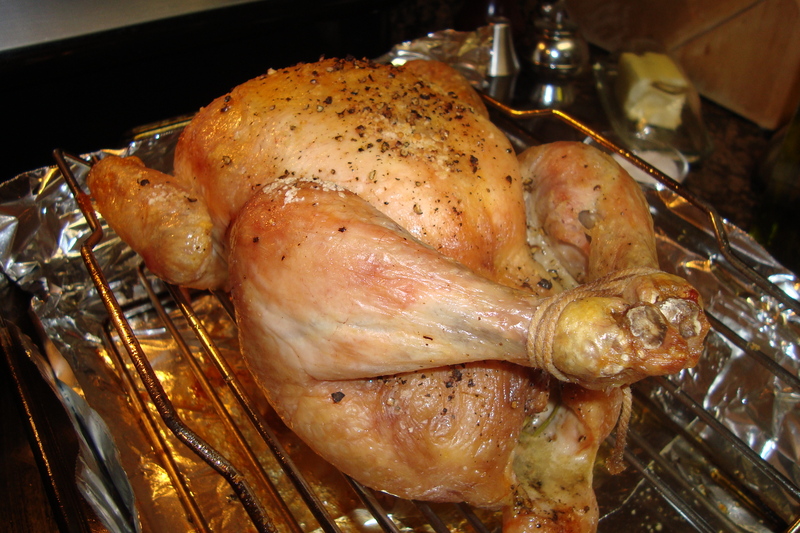 The chicken is done when you can insert a chopstick or knife between the leg and thigh, and the juices run clear. Allow to rest for at least 15 minutes and then carve. I served mine with roasted potatoes, carrots, brussel sprouts, and parsnips.